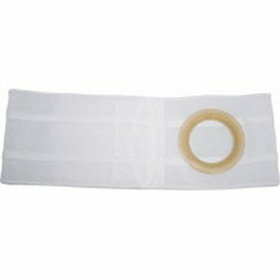 3″ Wide, 2-1/4″ belt ring, 39″ Waiste…The Nu-Form Support Belt is a comfortable binder which allows the elastic to form around bulges and other body shapes more naturally. It is made of a blend of polyester and elastic and feature an opening reinforced with a durable plastic ring for 360 wafer and pouch support. The belt ring is sturdy and will not lose its shape. Each belt secures with a sturdy Velcroí‰Œ¬ type closure that is adjustable to get the perfect fit. Made of a blend of polyester and elastic, come in a variety of widths and feature an opening reinforced with a durable plastic ring for 360í‰ŒÁ wafer and pouch support. Each belt secures with a sturdy Velcroí‰Œ¬ type closure that adjustable to get the perfect fit.